Renowned experts in supercomputing gathered at UD. 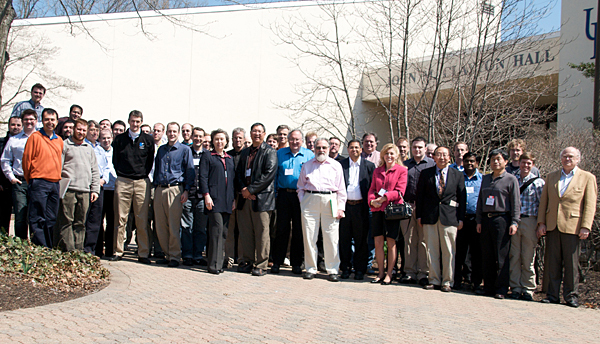 1:14 p.m., April 14, 2011--National supercomputing experts gathered at the University of Delaware’s John M. Clayton Hall April 5-6 for an informative workshop examining how parallel program execution models impact system software and hardware design. The group included extreme scale and exascale experts from industry, academia and government, including members of the Ubiquitous High Performance Computing (UHPC) Intel-led Runnemede and Sandia-led X-Caliber projects. Keynote speaker Jack Dennis explained that parallel program execution models play a crucial role in the design of high performance computers, as they dictate the way a program executes on the actual machine hardware. Learning from the past is necessary to creating future advances, he said. Dennis, from the Massachusetts Institute of Technology (MIT) Computer Science and Artificial Intelligence Laboratory, has spent more than 50 years studying computer architecture. He holds a doctorate from MIT and has been an MIT faculty member since 1958, where his early work involved time-sharing through PDP-1, a machine famous in computer science for originating the hacker culture. He also is a founding member of the Multics project which inspired the development of Unix, a member of the National Academy of Engineering, and a fellow of IEEE and the Association for Computing Machinery. Karl Steiner, senior associate provost for research development. Representatives from the Department of Defense, the National Science Foundation and the Department of Energy shared their vision and expertise in a series of presentations and panel discussions. The event also highlighted current research efforts and future expectations in execution models for extreme scale computing. High performance computing is important for science, national security and commercial applications, according to Kenneth E. Barner, chair of the Department of Electrical and Computer Engineering, which sponsored the workshop in collaboration with Intel Corporation and Sandia National Laboratories. Future extreme scale systems will enable improved large-scale simulations for fields such as hydrodynamics and molecular dynamics. “We are very pleased to see the active and significant role played by Professor Gao and his team at UD in forming strong partnerships with Intel and others in this area," Barner said. Guang Gao, UD Distinguished Professor of Electrical and Computer Engineering, co-chaired the event with Thomas Sterling, Arnaud and Edwards Professor of Computer Science at Louisiana State University. Gao and his team at the Computer Architecture and Parallel Systems Laboratory (CAPSL) are part of the Intel-led UHPC team focused on prototyping revolutionary program execution model and related hardware and software technologies for extreme-scale computing systems critical to national security, an initiative funded by the Defense Advanced Research Projects Agency’s (DARPA).